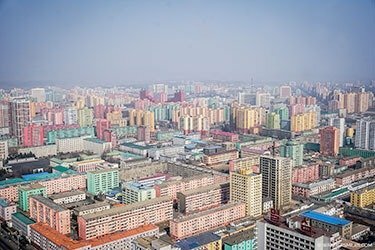 Pyongyang, the capital city of the Democratic People’s Republic of Korea (North Korea), is a unique and fascinating place. 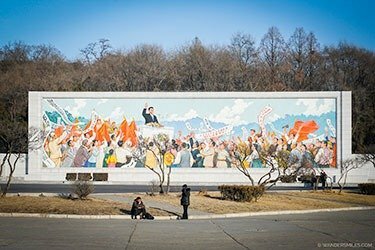 The main things to see in Pyongyang are showcasing the history of Workers’ Party of Korea, the conquests of the supreme leaders, Kim Il Sung and Kim Jong Il, and their desire for reunification with South Korea. There’s more to it than this but let’s save that for my blog! The Juche Tower is situated on the east bank of the River Taedong in Pyongyang, directly opposite Kim Il-sung Square on the west bank. 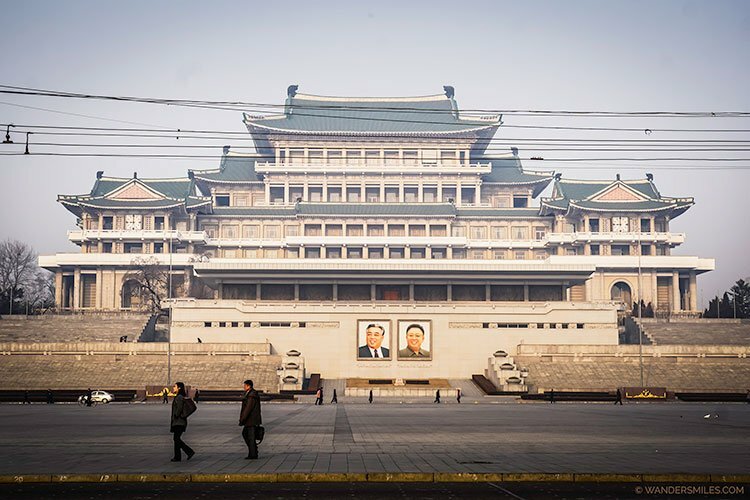 It was built to commemorate Kim Il-sung’s 70th birthday. At the entrance you can see 82 friendship plaques from foreign supporters and Juche study groups. 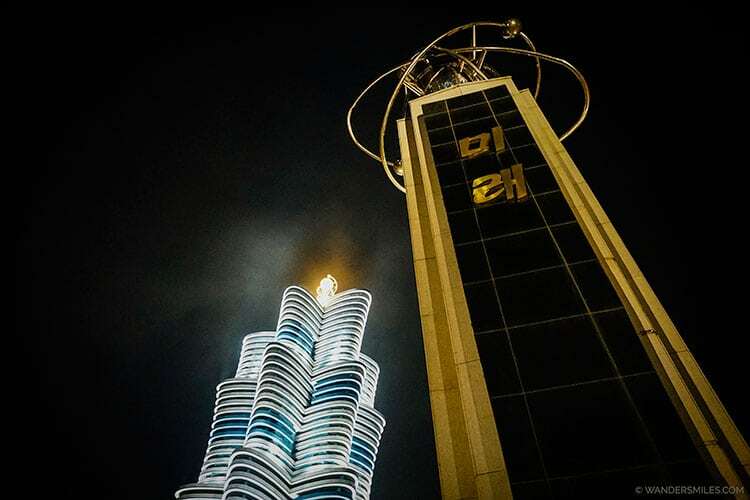 The Monument to Party Founding was erected in October 1995 (Juche 84) at Munsu Street to celebrate the 50th anniversary of the founding of the Workers’ Party of Korea hence why the monument is 50m tall. 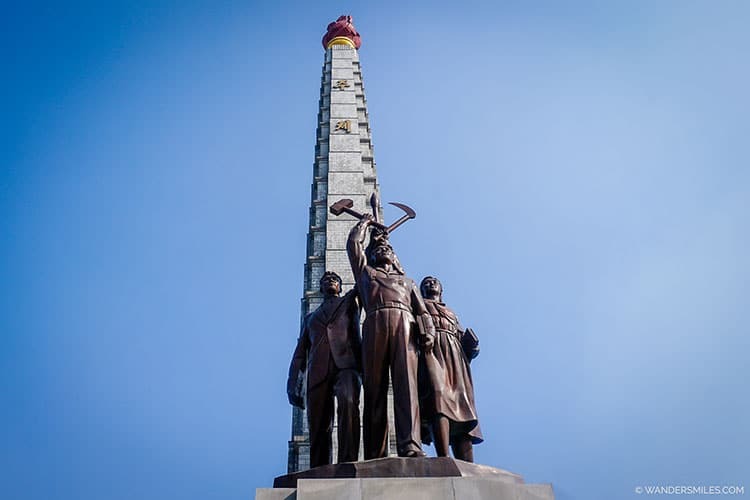 Built on the instruction of Kim Jong Il, it conveys the proud history of the Workers’ Party of Korea composed of workers, farmers of ‘traditional’ communist ideology and intellectuals depicted by the hammer, sickle and brush seized by a worker, a farmer and an intellectual. 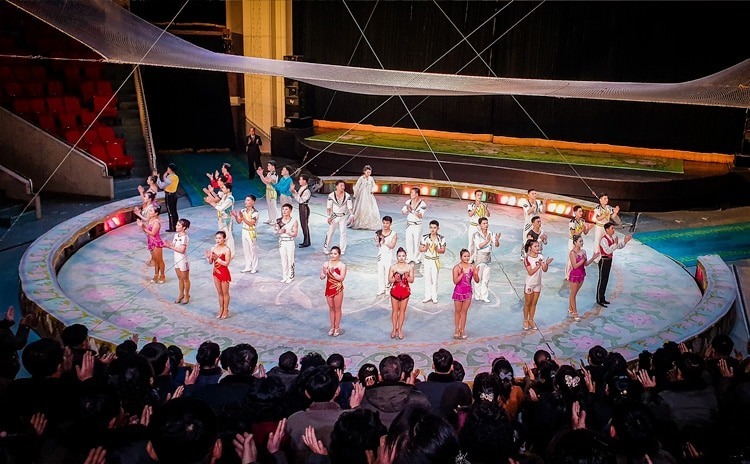 The Korean text on the surrounding circle reads; “The organisers of the victory of the Korean people and the leader of the Workers Party of Korea!” and the inner diameter of 42m reflects the year General Kim Jong Il was born (1942). The red apartments were built to represent the shape of the flags, the writing on the top essentially means ‘ever victorious’. A 20 metre high giant bronze monument to Kim Il-sung and Kim Jong-il on Mansu Hill is one of the most sacred sites in North Korea. It is a collection of monuments (228 figures in total) and behind the Great Leaders is a mosaic mural portraying Mount Paektu, a mountain considered to be sacred within Korea. 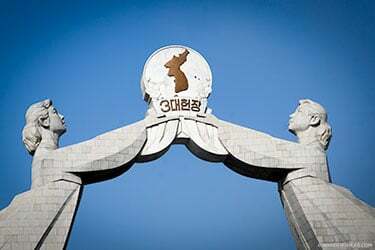 On either side of the leaders, there are enormous stones with KWP flags and 228 bronze figures all standing at 5 meters high. 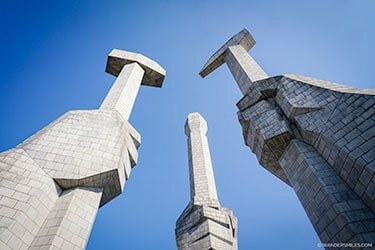 This sculpture is symbolic of the socialist revolution and the struggle against North Korea’s imperialist enemies. Visitors are expected to show the correct visiting etiquette by purchasing flowers to lay at the giant statues’ feet, marching in sombre line, hand by your sides and bowing. 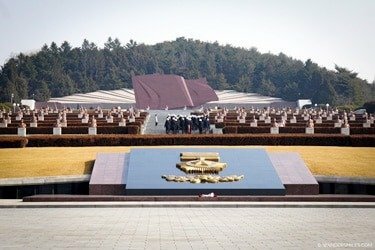 Taesongsan Revolutionary Martyrs’ Cemetery is a memorial to the North Korean soldiers fighting for freedom and independence against Japanese rule. 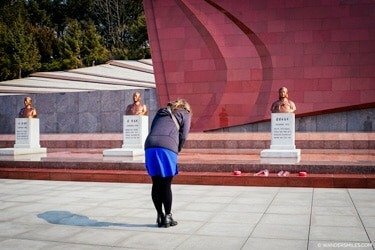 The cemetery is constructed on top of Mount Taesong, just outside Pyongyang and boasts a magnificent view of Pyongyang city if you catch it on a clear day. 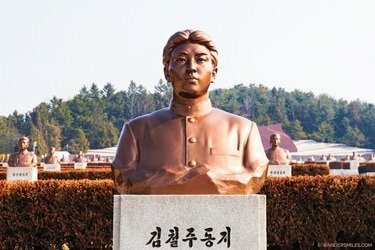 Bronze busts adorn each grave but the most notorious is the grave of Kim Jong Suk, wife of Kim Il Sung and mother of Kim Jong Il, and hailed as an anti-Japanese war hero, can be found at the top of the cemetery. It is etiquette to bow to her statue. 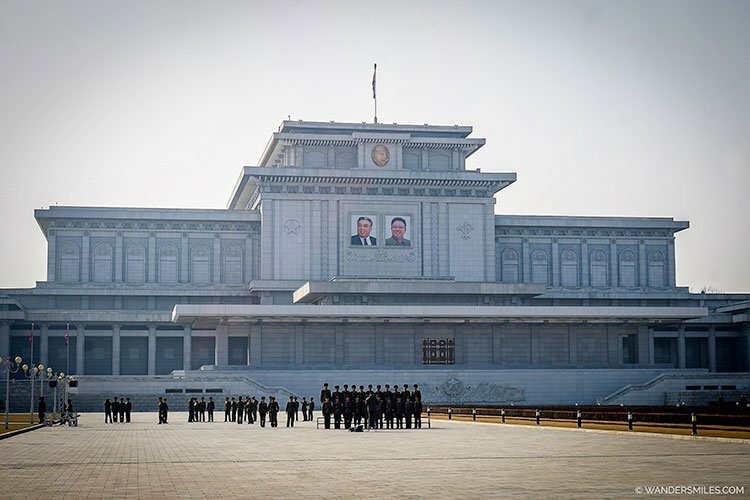 The Kumsusan Palace of the Sun is a mausoleum complex of the DPRK leaders, President Kim Il Sung and General Kim Jong Il, lie in state. 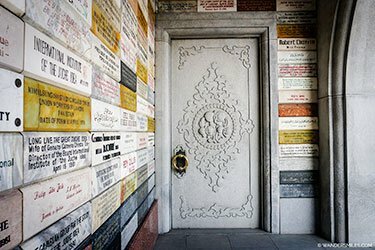 Inside separate rooms, their embalmed bodies lie presented inside climate-controlled clear glass sarcophagi for public viewing. Any visitors are required to wear formal dress, you enter through metal detectors, step across show cleaners and go through blowers to rid your clothes of dust. It is mandatory to stand in a line and bow to the leaders 3 times, once on the left, then the head, then to the right. 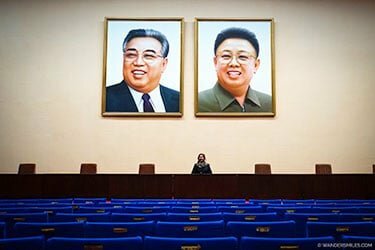 Their most treasured possessions such as yacht, Mercedes and even the train that Kim Jong-il died in which was presented in the same state including the document for provisions of fish to the people with his final signature on. The Kumsusan Palace of the Sun is open to foreign traveler only of a Thursday and Sunday morning, or on special occasions. Strictly no photography is allowed until you reach the gardens. The visit is a surreal but interesting experience. The Victorious Fatherland War Museum is a large museum devoted to North Korea’s victories against its imperialist enemies. 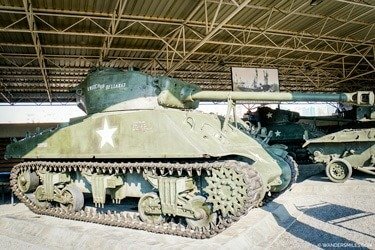 You are greeted by large bronze war figures and a huge display of American tanks, helicopters and equipment all taken down or recovered. Upon entering the main museum, photos or recording of any kind was not allowed. 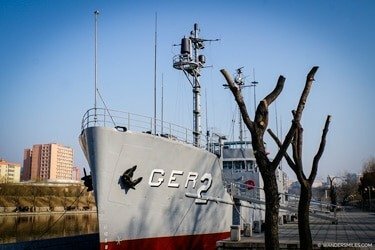 The USS Pueblo is on show at the museum which was attacked and seized by the North Korean Navy in 1968. One sailor was killed in the assault and 82 were captured and held prisoner for 11 months before they were freed, their ‘confessions’ are on show inside the ship. This Cold War spy ship is the only U.S. Navy vessel being held by a foreign government. 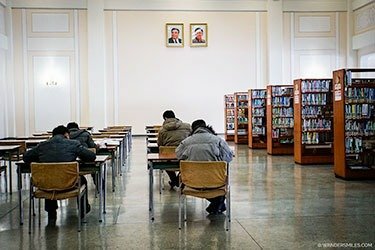 The Grand People’s Study House is the national library of North Korea. 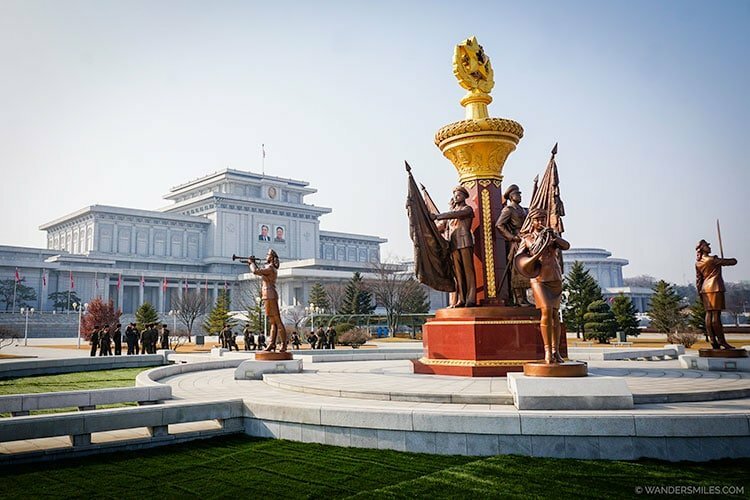 It is located in the centre of Pyongyang and forms the background to Kim Il Sung Square. 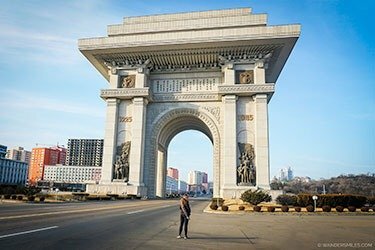 It took a year and 9 months to be completed and was opened in April 1982 to coincide with President Kim-Il-sung’s 70th birthday. It is stocked with 30 million books and can accommodate 10,000 people per day. We joined an English class and the students were super excited to try out their English on a native speaker. 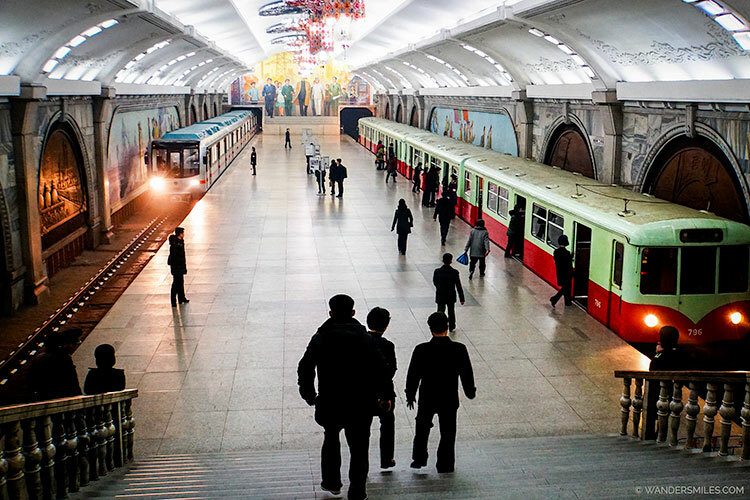 The Pyongyang Metro consists of two lines with 17 stations and is one of the deepest metros in the world, with the track reported to be 110 metres (360 ft) deep underground as it also serves as a bomb shelter. 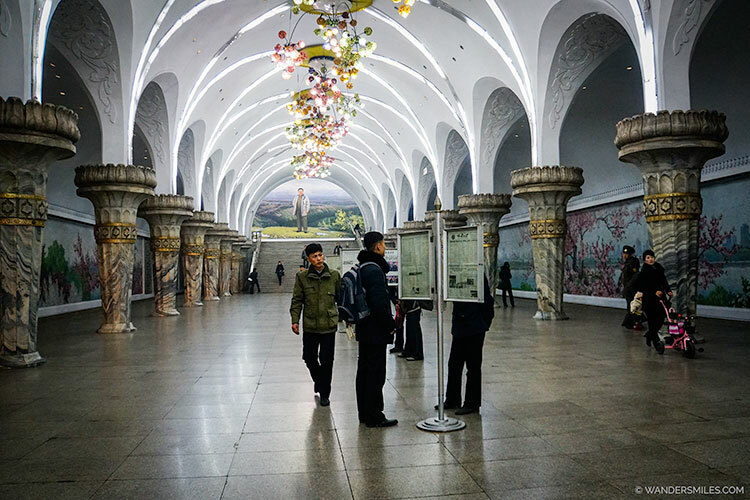 Socialist realist art such as mosaics, murals and statues can be found in the stations. Trains run every 3 to 5 minutes with 500,000 riders per day. There’s 2 main stations that tourists see although it is now possible to ride on the rest of the metro. Prosperity Station, the first stop on Line 1 is one of the larger stations and Glory Station. has chandeliers which represent the fireworks that went up after the end of the Korean War. The North Koreans can be seen at the newspaper stands looking for the latest scoop on the Trump and Kim Jong-un Summit in Vietnam. Kimilsungia is a tropical orchid strain which was presented to President Kim Il Sung as gift during his visit to Indonesia. Kimjongilia is a begonia strain named after Kim Jong Il. 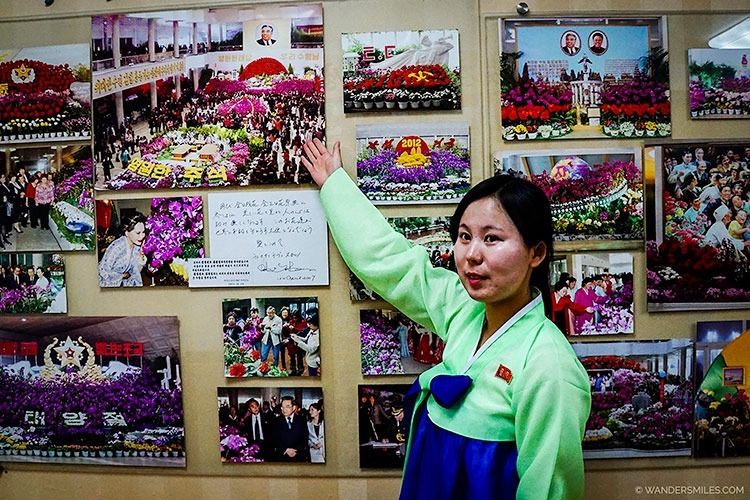 The Kimilsungia exhibition can be seen around Kim Il Sung’s birthday (Festival of the Sun) on the 15th of April. 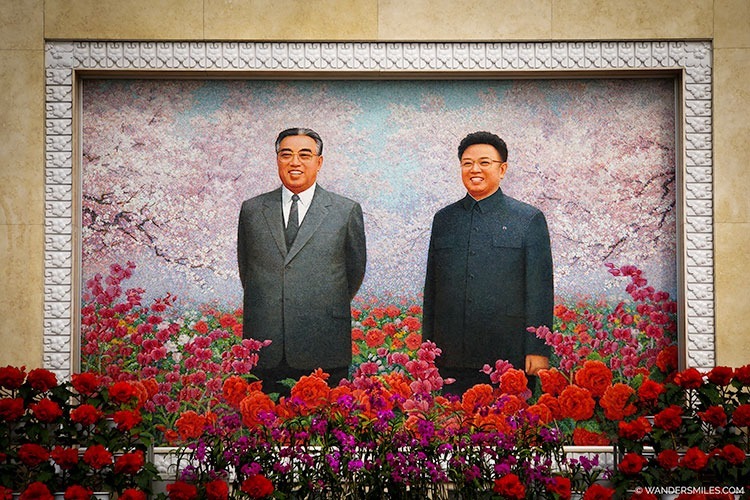 The Kimjongilia exhibition can be seen around Kim Jong Il’s birthday (Festival of the Shining Star) on 16th of February. Mirae Scientists Street (Future Scientists Street) was formally opened in 2015 and was developed to house scientific institutions and their employees. The tallest building is the 53-story blue Mirae Unha Tower. The street is designed to emphasise Kim Jong-un’s focus on science and technology, built around the regime’s nuclear weapons development. Mirae Scientists Street was reportedly the first location where the Mirae public WiFi network was installed. 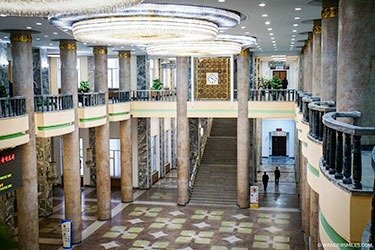 Pyongyang Circus was completed on May 1, Juche 78 (1989) so it is a fairly modern building filled with trophies in the corridors. You will be in awe of the daring trapeze and acrobatic routines, some had me hiding behind my hands as they were elegantly thrown from one side of the room of the other. There were comedy interludes with audience participation. however, I was devastated to see a bear in one of the performances, we were not warned before the show. I’m told this does not happen in the Korea People’s Army Circus. Every morning the workers are encouraged and motivated by the beats of the Socialist Women’s Union of Korea. They perform for 2 hours and we saw different coloured uniforms around the city. 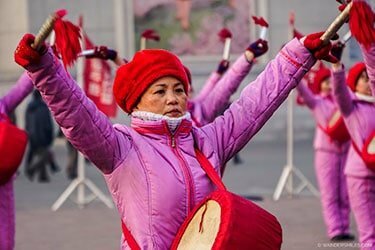 These ladies were in a prime spot in front of the Grand Theatre where revolutionary operas and dances are performed. 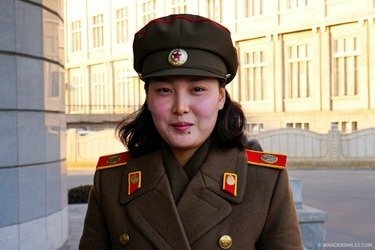 The Socialist Women’s Union of Korea is the oldest and one of the most important mass organisations in DPRK. Membership has been restricted to those women who are not members of any other mass organisation. As a result, Union members are effectively composed of women who do not work outside of home. Women between the ages of 31 and 60 are eligible for membership, although if a woman marries and becomes a housewife, she is eligible regardless of age.